As a fan of the game series, I like it. If you're a fan of the video game series, you'll enjoy this...well, at least I did. I gave it four stars because I was hoping the animation would be better. As a major fan of the video game series, when I initially heard about Samurai Warriors getting an anime adaptation I was very hyped. The game covered the whole of Sengoku Period and had a wide range of characters that could potentially been a 50 episode long TV series covering the whole Sengoku Jidai from start to finish from the perspective of the Warriors game. This was possible considering how popular the games were and how much it sells domestically and internationally. Then came the Sanada OVA which slapped me right in the face, focusing on the lesser interesting characters who only appears near the end of the time line and rounding the wide range of characters down to a few out of the whole franchise and give them a makeover that lacks detail but still retains their original traits and costumes. In addition, the animation themselves are outdated and looking worse than older shows such as Gundam 00. Massive battle scenes are covered in cheap CG that clearly looks different than the background. My hopes for the TV series was not high as the TV series looks identical to the OVA. I watched it none the less as this season was some what slow and I still enjoy seeing the characters I liked in the anime. Maybe because my expectation was so low, the show manage to grab my interest through out the whole thing and remind me to watch this on Sunday night. What grabbed my interest was not the art, or the animation but the good OSTs and OP/EDs as well as the character's voice acting. Furthermore while the story and setting was not the best, the show still manage to stick to its main story of the two brothers and the two opposing clans without going off tangent. The pacing of the show however could be improved much more, the battles feels like an anti-climax despite the many episodes spent building them up. Overall the show had lots and lots and lots of potential that were sadly not put in good use, but what we got was not as disastrous as one could imagine. Great and epic anime we ever seen and similarity between two animes based on Japanese Vidoe Games. Good storylines based on both Japanese Video Game by Koei and based on Japan's bloody but epic history. Similarity between Capom's Segoku Barasa and Koei's Samurai Warriors: Same characters, same storylines, same battles but different character designs and artists. Two epic animes came from same story. We will always continue watching this epic anime. What did I expect really? 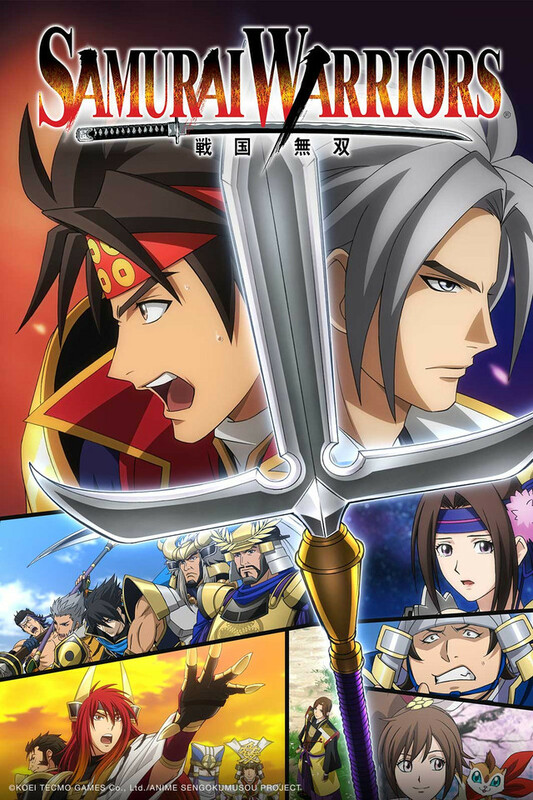 The Samurai Warriors anime borrows heavily from the game of the same name, developed by Tecmo Koei. Character designs are exactly as they were in the game and the story is a rough, anime-fied, history of the Warring States era of Japan. Unfortunately, there was some other aspects from the game that were borrowed too. Main characters are incredibly overpowered. Regular troops are pretty much useless and act as cannon fodder. What results from this is little or no tension in fights or battle sequences. Outside the main fight between two characters, you see average-joe soldiers shoot and miss indefinitely. Supposedly there was a siege that was happening in the first episode, but you don't get to see any of that happening because the scene is 100% focused on the main fight. Granted, this review was made after the first episode, but it was a really weak first showing. lol, this is my first review. when i was drafting this i was like wtf it's got to be like 250 characters or less!?!?!? I'm really glad this series exists because I love the Warriors video games. Most of it is historical and they portray a lot of the historical characters interestingly.I don't mean just by design, i mean personality wise too. The story of the show is kinda straight forward and in a sense i can get why they decided to start with where they did as Sengoku Basara already covered the wars with Oda Nobunaga so in a sense they beat them to the punch. If they started with Oda Nobunaga it would feel a bit congested in a marketing aspect and also i feel like the message of this series hit a lot harder as this series/era ends with the warrior. Part of what i didn't like about the series(don't know if this is the translators fault or the original writers) is that the main characters are self aware of their fate and accept it without hesitation. Also i doubt in context they referred to the era as the warring states. I feel like some of it has to come from the immersion of the story and having you understand their world opposed to making their world adapt to ours. I can't stand having the character pick up the script and rewrite their self awareness into the show. It's not like deadpool on how that's part of the character and that's part of the comic relief. this is different, in a sense it's belittling the viewer and saying "you aren't smart enough to understand so we'll say it for you"
Some of the music in this show is pretty good. I'm also glad they went with Wagakki Band for the OP and ED. I'd like to think this help them breach out more into the western market for the people that watched the first episode. idk how their concert went at AX15 but i'd like to think that people were able to recognize them as the band that did the OP for samurai warriors/sengoku musou. I feel like one of the biggest let downs of the series was the animation. it felt dated for it's time or maybe on par 10 years ago. the animation feels contemporary to that of inuyasha. also the fighting scenes did not feel epic at all. I was hoping that they would of gone in a similar direction of how the video game animates characters doing their signature attacks. Sengoku Basara crushed that aspect in their animation out of the water. both sengoku basara 2 and Samurai warriors seem underwhelming to that of Sengoku Basara. Also the really cheap CG battling soldiers was laughable, it seemed like they used the same cut over and over again. i feel like this series flopped and was a bit of a disappointment. i'm wondering though if there is any plans to do another anime. Alright, I came into this with the lowest of low expectations; the Warrior's Gaming Series isn't known for it's compelling story even though it takes right out of actual History. Not only doe's it delve deeper into the story but it also allows you to get your over the top action. It uses the Musou attacks from the game series but much subtler and in a way that almost makes it fit into the show, although how can summon spin a spear and kill 200 people? In real life, probably never unless it was shot out of a rotating glaive into a crowd of unsuspecting pedestrians. Well here it kills about 30 or so, still far-fetched but more believable. Overall it could use some improvements of course, but when you take the base material used for it, surely it deserves praise. Entertaining enough and with a cute squirrel too. Generally its entertaining and never strays too far from the history it is based upon. Every now and then I keep wishing I was watching Oda Nobuna and Monkey though. Personally I would have found it more entertaining if the samurai main characters weren't absolutely so superhuman on the battle field. The little flying squirrel is cute. Four stars (3 with one extra for the squirrel). The animation is gorgeous, the characters seem interesting enough and the story seem OK, but the storytelling can be pretty boring. Maybe it'll get better as the series progress, but for now I'll give it a three stare rating. If the storytelling improves, I'll definitely change it to a four, but right now it really drags the whole thing down. Edit: Downgraded to two stars due to awful storytelling. Since there isn't a review for this yet, i figured i'd typed one up. Just like the review said, its a civil war that tore Japan over two centuries is nearing its end and the regional warlords who survived the bloodsheds are ready for a final showdown. I wouldn't rate it a 5 since its a new series(might come back and redo my review), but its worth checking out nonetheless.